• Special 2016 College Preview Section: CB takes a look at all the top teams as well as players on every level of college baseball in 37-page section. • Top Draftable College Players: CB looks at 84 special players who have a chance of being chosen in the first 2 rounds of the June MLB Draft. 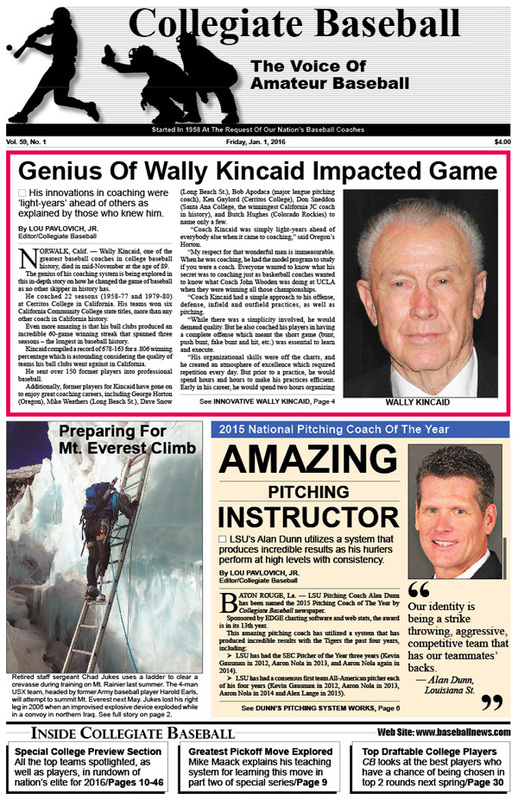 • Genius Of Wally Kincaid: Legendary coach formulated incredible innovations that were ‘light-years’ ahead of game. • 2015 National Pitching Coach Of The Year: LSU’s Alan Dunn explains his system that allows hurlers to perform at high levels with consistency. • Preparing For Mt. Everest Climb: In only 4 months, former Army baseball player Harold Earls and team will climb highest mountain in the world. • Incredible Journey: LSU skipper Paul Mainieri checks item off bucket list as he flies with U.S. Air Force Thunderbirds in a F-16 fighter jet which can reach a maximum speed of 1,500 mph. • Filthiest Pickoff Ever Designed: Part 2 of this special series gives all the teaching techniques of this amazing move developed by Mike Maack. When he coached at the University of Central Florida, his pitching staff picked off 287 over 5 seasons at first base. • Who Is No. 1 In NCAA Div. I? : In-depth analysis explains why this team is the favorite to capture its first national title in baseball in 2016. • NCAA Div. I Fabulous 40 Pre-Season Poll: Entire top 40 poll listed along with teams receiving votes, plus in-depth rundown on each of the top 40 ranked teams in the nation. • NCAA Div. I Conference Races, Top Players: In-depth look at how every conference race in 2016 is expected to play out, last year’s finishes for each team, what their 2015 NCAA RPI ratings were, projected Pitchers and Players of The Year in each league and a rundown of the top players on each team. • NCAA Div. I Louisville Slugger Pre-Season All-Americans: 81 first, second and third team pre-season All-Americans are featured who are the elite players for 2016. • NCAA Div. II Top Players To Watch: Pre-Season All-Americans, Players To Watch and Newcomers To Watch are listed in this special rundown. • NCAA Div. II Pre-Season Top 40: The top 40 teams in the nation and others receiving votes are listed. A special in-depth rundown on the top 25 NCAA Div. II teams in the nation are listed. • NCAA Div. III Top Players To Watch: Collegiate Baseball takes a look at the top players at each position across the USA. • NCAA Div. III Pre-Season Top 40: The top 40 teams in the nation and others receiving votes are listed. A special in-depth rundown on each of the top 25 NCAA Div. III teams in the USA are listed. • NAIA’s Top Players: 2016 Pre-Season All-Americans listed along with Players To Watch at every position. • NAIA Pre-Season Top 25: Top 25 teams in the nation and others receiving votes are listed. In addition, CB does takes an in-depth look at the top 17 NAIA teams in the USA. • Top Junior College Players Across USA: Exclusive list of top community college players across nation listed at each position. • NJCAA Div. I Top 20 Poll. Coaches pick top 20 teams going into 2016 season as CB does an in-depth analysis on each of the top 10 teams in the nation. • NJCAA Div. II Top 20: Coaches pick top 20 teams heading into 2016 as CB examines top 5 teams with in-depth analysis. • NJCAA Div. III Top 10: Coaches pick top 10 teams in nation as CB examines each of the top 5 teams. • California Junior College Pre-Season All-Americans: California coaches honor amazing players heading into 2016 season. • Northwest J.C. Top 10: Coaches determine pre-season top 10 teams going into 2016 as CB examines top 5 Northwest JCs. • Coaching Clinics Across USA: CB takes a look at upcoming instructional clinics for coaches that are scheduled in the near future. • Elite Umpire Bud Grainger Dies: Widely respected arbiter gained notoriety as the greatest “hustling” umpire in history. • How To Be A Great Parent: Justin Dehmer gives 7 special sentences parents can utilize for their athletes. To purchase the Jan. 1, 2016 edition of Collegiate Baseball or subscribe, CLICK HERE.